I don’t want to say too much about Shaq Lawson, since I managed to catch this game live. I will say this, though: Since July, I have been hyping Lawson as the next Clemson Force Players after Vic Beasley was “my guy” last class. Shouts to the good people at Draft Breakdown. The first play of the game shows the difference between Lawson and Beasley. While Beasley’s one and only priority was to get after the quarterback, Lawson is more than willing to give up some time for his run responsibilities. As a stand-up nine-technique, he gets a yard in the backfield, stops to set the edge and keeps his shoulder clear. On a third and long, we see Lawson’s first real attempt at a pass rush. The left tackle he’s going against is Ronnie Stanley, who some have compared to a Tyron Smith and many thought would have declared last season as just a redshirt sophomore. There are about eight players I see as first round locks in the 2016 class, and he’s one of them. 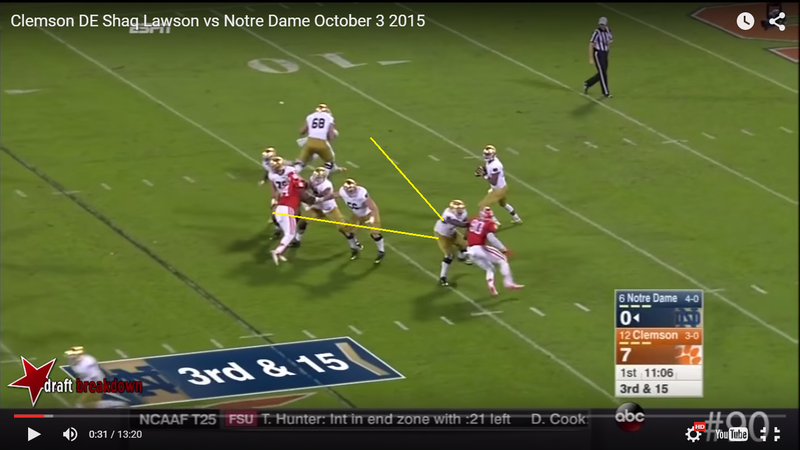 On this play, we saw something Emmanuel Ogbah, our first breakdown of the season, didn’t show often: A counter. Ogbah’s mentality was if he could beat a lineman off the line, he could beat him. When you go against athletic tackles, though, those chances are few and far between. Remember, against Kansas State, Ogbah went up against a non-prospect right tackle and a left tackle who will most likely kick inside to guard at the next level. Stanley might be the first overall pick of the draft. They are both getting used to each other’s athletic ability. Lawson thinks he had it won early on in the down and ripped too quickly, using his shot to win outside. Stanley misjudged Lawson’s speed off the ball but recovered well. Now, if this were Ogbah, the play would be over for him. Lawson seems to have more body control, though. If Stanley was selling outside, which he was as a recovery for his early-down mistake, then Lawson either had to go through the potential first-rounder or inside of him to get to the quarterback. 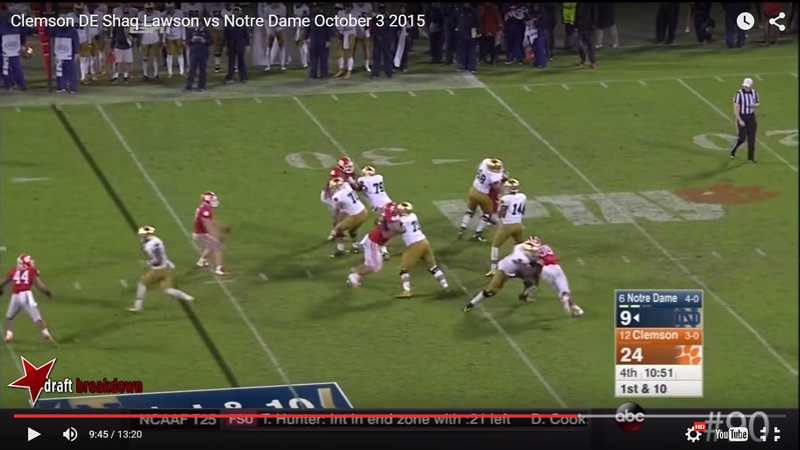 Lawson chose to counter Stanley’s overset with an inside spin, something that Beasley did often at Clemson, too. 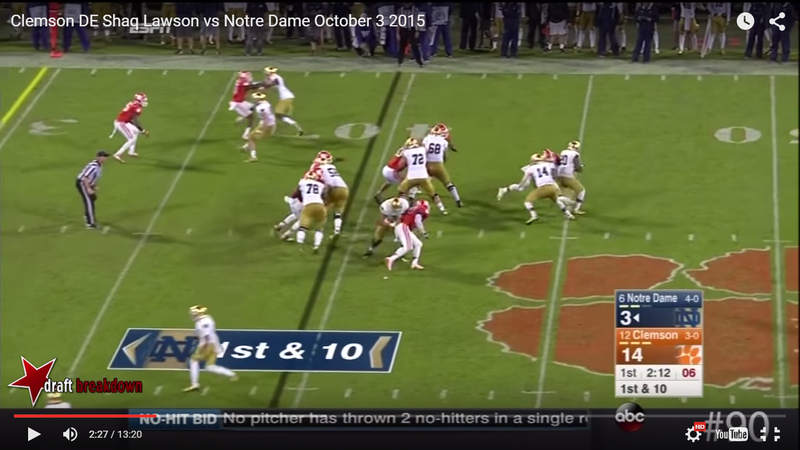 Unfortunately for Clemson, Notre Dame’s left guard was looking for work as they only sent a three-man rush on the play. Lawson won inside, but was double-teamed by the time he “won.” He still created a pressure, and it is evident that he knows how to play the small games in pass-rushing. That’s a very good sign. If he could make those type of decisions while looking as athletic as he’s been reported to be, there’s a shot he’s a special one. Gap integrity only goes so far. If you’re supposed to control the C- or D-gap, you’re not just supposed to let a running back jet past in the hole one gap over. Lawson sets the edge against the tight end and when the running back eliminates running his way, the defensive end sheds the block and makes a tackle for loss. Here’s another example of Lawson as a good run defender. As the read man against the option, if you fly up the field, the ball is surely to go in the opposite direction. Lawson is left unblocked, gets some depth, plays to the running back, but then cuts back to the quarterback, all while keeping his shoulders square to the man with the ball. Again, Lawson is unblocked at the line of scrimmage. This time, though, there’s a pulling guard looking for him. He does his job by closing down the line of scrimmage while looking for something coming back at him. By the time the guard gets to him, Lawson is a yard and a half deep. He gets low, slides past the guard and makes a tackle for loss. On this play, he’s in control of the tight end, but looks inside too early. The running back was still looking outside when Lawson got his head on the inside of the tight end’s. He did get back outside, though, making contact around one yard past the line of scrimmage. A little more patience and that’s bottled up on the edge. Stanley got first hands here, but Lawson just pushed through the punch, disarmed the stagnant hands, got low and drove through the left tackle. Stanley was leaning towards the end of the play, and Lawson had control before a guard came in looking for work. The screenshot above is great positioning by Lawson. His inside foot (step to contact/step and strike, whatever you want to call it) is up and driving, he’s lower than his man, his hands are on his opponent’s chest while his eyes are below or around the area of his eyes. The result? Stanley couldn’t handle the power and his post/drive foot (inside foot) no longer had the required stagger to keep balance. His feet started looking for stability wherever they could find it. Playing offensive tackle isn’t easy. When Stanley’s feet finally settled, his inside foot again was up, but his kick foot, his left/outside foot, was completely shot. How was he supposed to kick if his leg was already fully extended, unless he opened up with his inside foot again, which is the nightmare of any offensive line coach. Stanley had to “waist bend” and lean on Lawson. That was it. 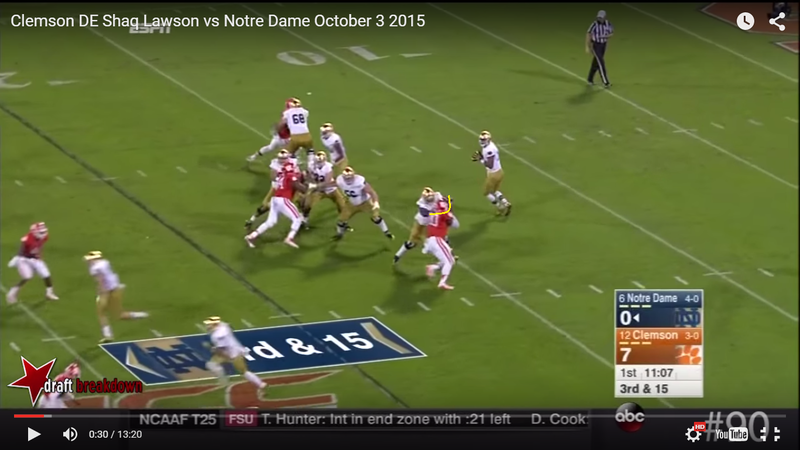 Lawson used leverage and power to the point where there was no longer a logical way for the offensive tackle to move. Then a guard came in to help and nothing showed up in the stat sheet. The thin margin between a sack and what looks to be a pedestrian play on the surface makes me wonder if defensive statistics can ever be trusted in this sport. Here’s the play everyone tweeted out on Saturday night. Stanley leans for first contact, when staying patience is the key to battling a spin move. 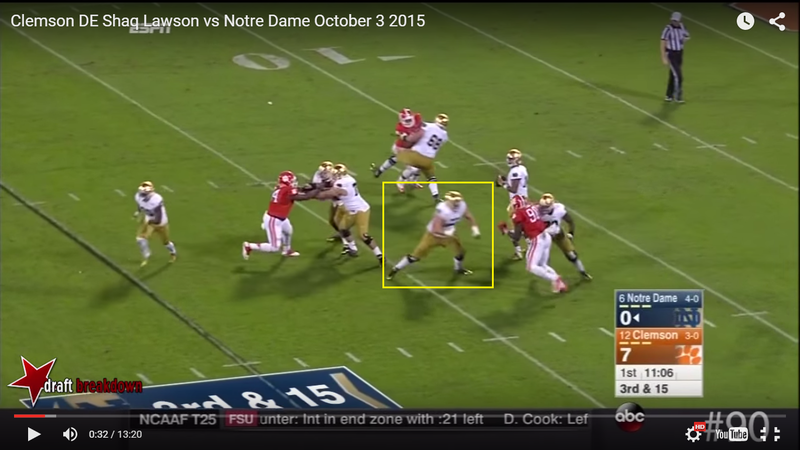 Lawson spins inside, is half picked up by the guard, then they tackle him to the ground and are called for holding. The matchup between these two is really fun to watch. They go one-on-one again with Lawson breaking Stanley’s early hands again. Lawson then bull rushes the lineman into his quarterback, but is pancaked to finish the play. Both are NFL talents, and I would be surprised if they weren’t both taken in the first round. 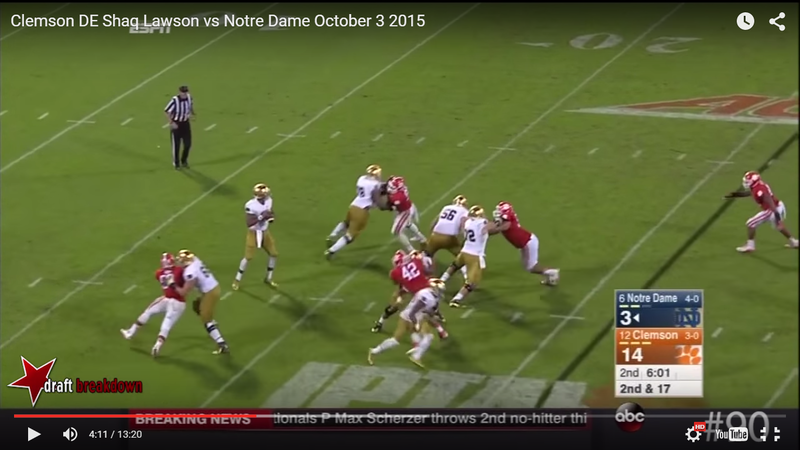 Notre Dame’s quarterback makes the wrong read on the option and Lawson gets another tackle for loss. Flashing his talents against a tight end for a pressure. Here Lawson is hand fighting with Stanley and shows some bend coming around the corner on the way to a pressure which forced the quarterback to run the ball. I think the most underrated attribute for pass-rushers right now is their stop-go ability. It’s good if someone has great closing speed, but if there’s no change of direction control, it’s easy to run yourself out of a play, too. Lawson clearly can go from point A to point B and back to point A with ease. He whips himself from an outside to inside attempt here fairly well, showing upper body strength. 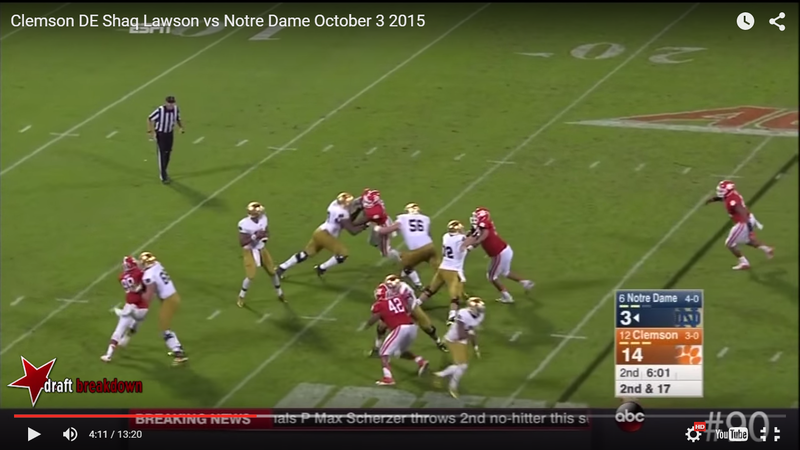 Overall, I think Shaq Lawson is a great prospect, as is Ronnie Stanley. Stanley has some tech issues he needs to workout, but has great potential with his long arms and general athleticism. At times, he was able to negate Lawson, who is 40 pounds lighter and has three inches of leverage to aid him. Lawson can win on the edge, converts speed to power, showed flashes of bend ability and has already proven he knows how to counter. I worry his closing speed is good, not great, but he has the tools to be a player who contributes through contact more than in space. A very similar player to Lawson is Frank Clark, who was the 63rd overall pick in last draft class. Clark is a Force player who at 6027 and 271 pounds has a similar frame to Clemson’s new top edge defender, too. If you have any comments or questions, make sure to either email me at justisfootball@gmail.com or ask me on Twitter.